As expected, the West Indies selectors have named a squad without most of the leading players for the Champions Trophy in September, giving an indication that there might not be an early resolution to the long drawn out contracts dispute. The mediator in the impasse between the West Indies Cricket Board (WICB) and the West Indies Players' Association (WIPA, Shridath Ramphal, had said that the ongoing negotiations between the disputing bodies in no way affected the obligation of the board to select the best available team for the Champions Trophy. He had hoped that the row would be resolved by the end of August, but the retention of a makeshift team for the tournament implies that little headway has been made in resolving the problem. Last month, a weakened 30-man pool had been chosen from among those players who declared themselves available for selection for the tournament within the deadline date. 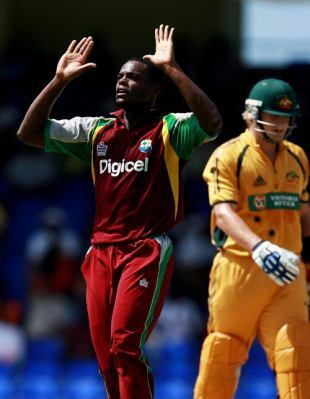 Daren Powell, the fast bowler who reportedly turned down the chance to be part of the West Indies side after Chris Gayle and Co. decided to strike, has been picked. Floyd Reifer, who captained a depleted West Indies side in the Test and one-day series losses to Bangladesh recently, has been appointed as captain. There are three omissions from the squad that played the ODI series against Bangladesh - Devon Thomas, the wicketkeeper-batsman, fast bowler Nelon Pascal and legspinner Rawl Lewis. The squad features two new inclusions; rookie Guyana batsman Royston Crandon receives his maiden international call-up while Chadwick Walton, who played the Tests against Bangladesh but was left out for the ODIs, earns a place. West Indies squad: Floyd Reifer (capt), Darren Sammy, David Bernard, Tino Best, Royston Crandon, Travis Dowlin, Andre Fletcher, Nikita Miller, Daren Powell, Kieran Powell, Dale Richards, Kemar Roach, Devon Smith, Gavin Tonge, Chadwick Walton (wk).